DF27 has no known phylogenetic equivalents at this time. This implies that the first DF27+ male was born not long after the P312+ most recent common ancestor. The P312 ancestor could easily have been a great-grandfather or even closer in relation to the first DF27+ male. If you are researching the male line of Y-DNA Haplogroups DF27, a subgroup of the R1b, I hope you find this site helpful. If you have tested positive for R1b, or DF27, or any of it’s subgroups, please use the links below to determine your unique haplogroup and submit your results to our Yahoo group and please include your results on FTDNA’s website. Click here for helpful Y-DNA research links! The Y-DNA test tells you about your direct male line, which would be your father, his father, and all the way back in time. Y-DNA also tells you about the history and location of your surname, or your last name. R1b consisted of the Yamnaya culture (3,500-2,500 BCE), and spread west into Europe creating the Corded Ware culture, which is ~75% Yamnaya autosomal DNA (aDNA), of the tested skeletons from modern day Germany. (Also, Yamnaya’s DNA contribution is ~50% of modern Central & Northern Europeans!) The English language derived from the Yamnaya, who had a Proto-Indo-European language. … 4,000 years ago, DF27 shows up, a descendant subclade down the Y-DNA branch from R1b, in the Iberian Peninsula, known as Iberia, where modern day Spain & Portugal, as well as Southern France, reside. 2,500 years ago, Greek historian Herodotus said of the Phocaeans, “it was they who made the Greeks acquainted with … Iberia”. Ancient Greek word for Iberia: Ιβηρία. Note: the Celts were a Culture, not a specific Y-DNA branch or bloodline, more of a group of a few different Y-DNA branches. Same with the Corded Ware cultures. 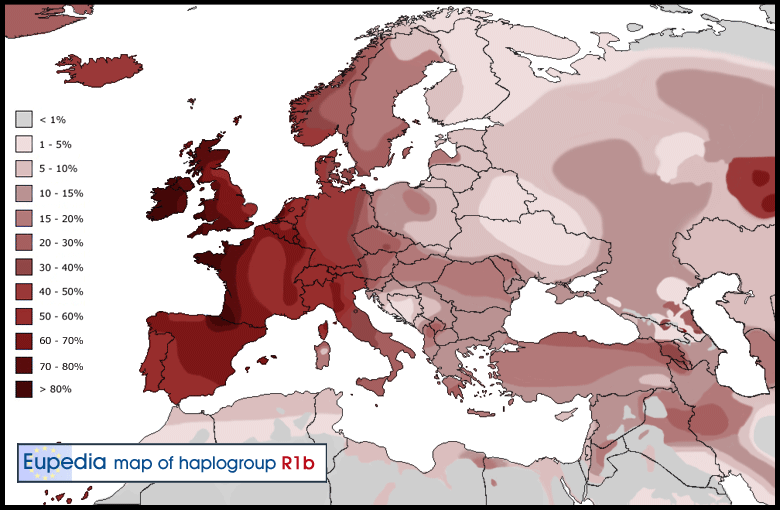 Welcome to the new website, focusing on the Y-DNA Haplogroup DF27, a sub group of the large R1b Haplogroup. The Bronze Age did not appear in Iberia until 1800 BCE, and was mostly confined to the cultures of El Argar and Los Millares in south-east Spain, with sporadic sites showing up in Castile by 1700 BCE and in Extremadura and southern Portugal by 1500 BCE. These Early Bronze Age sites typically did not have more than some bronze daggers or axes and cannot be considered proper Bronze Age societies, but rather Copper Age societies with occasional bronze artefacts (perhaps imported). These cultures might have been founded by small groups of R1b adventurers looking for easy conquests in parts of Europe that did not yet have bronze weapons. They would have become a small ruling elite, would have had children with local women, and within a few generations their Indo-European language would have been lost, absorbed by the indigenous languages (=> see How did the Basques become R1b ? ).